Sazon seasoning from Eat Like a Yogi puts you in touch with your Latin flair. Sazon seasoning. Ever heard of it? I hadn’t either until I tried to replicate a dish from the hot bar at the co-op where I like to shop. The dish—Cuban piccadillo—is abundantly flavorful but seemed to contain only a few ingredients, so I figured it must be full of seasoning. When I looked online for a recipe, there it was: sazon. I had heard of a nutmeg seed and cinnamon stick, but a sazon? What was this exotic food? Thank you, Google—within seconds I figured out that it’s actually a blend of spices, similar to pumpkin pie spice or curry powder. 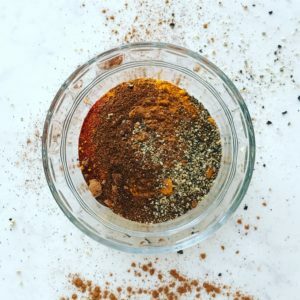 I love spice blends, which merge several ingredients to create something new and distinctive. Really that’s the essence of all creativity—taking parts of something and rearranging them to make something brand new. This is why I find cooking so exciting and pure. The magic of sazon is the addition of several aromatic spices in small quantities, so they lend fragrance and flavor without being readily identifiable. It’s an exciting tease in a dish like piccadillo, which otherwise could seem rather ordinary. Sazon is delicious over roasted squash, makes a convenient spice base for tortilla soup, and is the only seasoning you’ll need for tacos, whether you’re using beans, lentils, or a soy product like tempeh or tofu. This mix should last through at least three or four recipes; just make sure it’s in a airtight container so it stays fresh and potent. Click through for the recipe that inspired it all: Vegan piccadillo. Blend all of the spices very well and store in an airtight container. For best results use within four weeks.